The Small Business Community Association (SBCA) has selected N-Sight Consulting LLC for the 2016 Best of Business Award for the Small Business category. Since 2006, the SBCA has annually recognized small business for the value and services they provide their communities. SBCA's Best of Business Award holders are chosen specifically because they are a valuable asset to their community and exemplify what makes small businesses great. 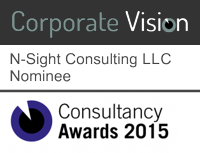 N-Sight Consulting is honored to have been selected as a 2016 award winner. As always, we owe our success to our clients and those who work with and for us, as we cannot accomplish anything without their support, and we extend our heartfelt thanks to them. David Cawrse, founder of N-Sight Consulting and our lead FileMaker developer, has been selected by FileMaker, Inc. as a charter member of FileMaker Champions. FileMaker Champions are a select group of people who use and love the FileMaker Platform and want to spread the word about it. On Tuesday, May 10, 2016, FileMaker, Inc. released its latest update to the FileMaker Platform, FileMaker 15. This latest version offers improvements in Mobility, Automation & Integration, Ease of User, Security and Performance. These updates help keep the FileMaker Platform the most powerful software for creating custom apps that work seamlessly across iPad, iPhone, Windows, Mac, and the web. Check out the video below for a summary of the FileMaker Platform. And be sure to follow our blog posts over the next few days, as we review each of FileMaker 15's major improvements.